The sesquicentennial of the birth of the influential American philosopher and educator John Dewey in 2009 marked an opportunity for members of the society that bears his name to reflect on his legacy. 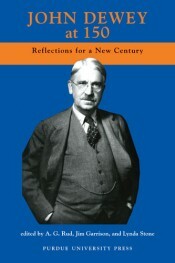 This book contains papers also published in the journal of the John Dewey Society, Education and Culture (Volume 25,2). Contents: Introduction: A. G. Rud, Jim Garrison, and Lynda Stone; Looking Forward from A Common Faith (Nel Noddings); Secularism, Secularization, and John Dewey (Larry A. Hickman); How to Use Pragmatism Pragmatically? Suggestions for the Twenty-First Century (Gert J. J. Biesta); Transforming Schooling through Technology: Twenty-First-Century Approaches to Participatory Learning (Craig A. Cunningham); Dewey’s Aesthetics and Today’s Moral Education (Jiwon Kim); Toward Inclusion and Human Unity: Rethinking Dewey’s Democratic Community (Hongmei Peng); More than “Mere Ideas”: Deweyan Tools for the Contemporary Philosopher (Barbara S. Stengel); Reconstruction in Dewey’s Pragmatism: Home, Neighborhood, and Otherness (Naoko Saito); John Dewey’s Contribution to Pragmatic Cosmopolitanism (Leonard J. Waks); Dewey and Cosmopolitanism (David T. Hansen). A. G. Rud is head of the Department of Educational Studies at Purdue University and editor of the journal of the John Dewey Society, Education and Culture. His areas of interest include philosophy of education, leadership education, and moral education. Jim Garrison is a professor of philosophy of education at Virginia Tech in Blacksburg, Virginia. His work concentrates on philosophical pragmatism. Lynda Stone is a professor of philosophy of education at University of North Carolina, director of Graduate Studies and area chair of Culture, Curriculum and Change.